Although we have had a few cold days, this is the first real taste of winter here in Santa Fe and I am writing a few greeting cards to mail . Years ago, I sent out many more holiday cards, perhaps email has made a difference in my habits. Nevertheless, I still like to select meaningful greetings to those friends and relatives we are not able to visit as often as we would wish. The history of sending printed holiday greetings tells of Sir Henry Cole, a Director of the Victoria and Albert Museum in London. In May, 1843, Cole commissioned his friend, John Callcott Horsley, a former pupil of the National Academy known for his illustrations to produce a Christmas greeting card in an initial edition of 1,000. The card was produced on cardboard and measured 5 1/8inches x 3 ¼ inches and was a handpainted triptych The images depicted were of a family raising glasses of wine in a toast with side scenes of charity giving for the poor. The greeting read “A Merry Christmas and a Happy New Year to You”. Subsequently, an additional edition was printed, the cards selling for 1 shilling each. This was an essentially providential market ploy for Cole as he had helped introduce the first postage stamp (Penny Post) three years earlier. The first printed cards available in America were available from the lithograph firm of Prang and Mayer in 1847. The first American president and first lady to send White House cards during the Christmas season was Calvin Coolidge in 1927 and the first “official” White House Christmas card was sent in 1953 by Dwight Eisenhower. The tradition of sending cards included merchants sending their greetings to valued customers and charity organizations soliciting donations. Today many card manufacturers offer free email cards. 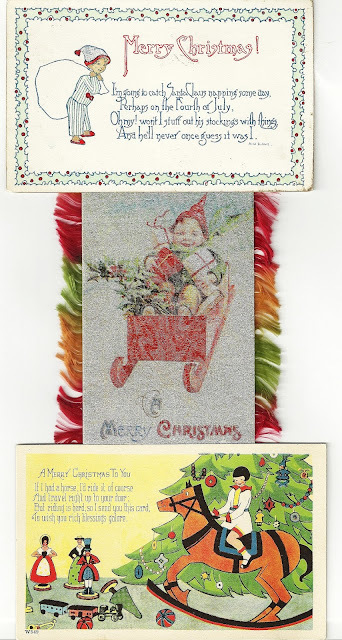 Vintage greeting cards are easy to find. as well as many reproduction cards. In December,2013 an original Cole card was sold at auction for 4,200 pounds (over $6,000 dollars). Here are a few cards from my collection depicting children dressed for Santa.
" A Merry Christmas and a Happy New Year to You"